For the software developed by Apple, see QuickTime. A mock-up of the presentation of a Quick Time Event in a video game. 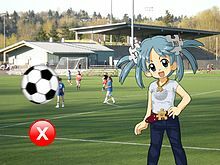 By pressing the controller's "X" button in time, the player, as the character on the right, can avoid being hit by the oncoming ball. In video games, a quick time event (QTE) is a method of context-sensitive gameplay in which the player performs actions on the control device shortly after the appearance of an on-screen instruction/prompt. It allows for limited control of the game character during cut scenes or cinematic sequences in the game. Performing the wrong prompt or not at all results in the character's failure at their task and often in an immediate game over, or a life being lost and being shown a death/failure animation. QTEs generally involve the player following onscreen prompts to press buttons or manipulate joysticks within a limited amount of time. More recent games on consoles with motion-sensitive controls feature QTEs requiring specific movements from the player. The prompts are often displayed as a graphical image of the physical controller button; for example, games on the PlayStation consoles may show any of the four colored face buttons (X, square, circle, or triangle) as input for the event. Such actions are either atypical of the normal controls during the game, or in a different context from their assigned functions. Whilst most prompts simply require the player to push the appropriate button in time, some may require different types of actions, such as repeatedly pressing a button a certain number of times within the time limit, or hitting the button with precise timing. Yu Suzuki is credited with coining the term "Quick Time Event" and popularizing their use in his game Shenmue. In the 1980s, Dragon's Lair (Cinematronics, June 1983), Cliff Hanger (Stern, December 1983) and Road Blaster (Data East, 1985) were interactive movie laserdisc video games that showed video clips stored on a laserdisc. This gave them graphics on par with an animated cartoon at a time when video games were composed of simple, pixelated characters, but left little room for more advanced gameplay elements. Gameplay consisted of watching an animated video and pressing the correct button every few seconds to avoid seeing a (circumstance-specific) loss scene and losing a life. Compared to modern titles, games like Dragon's Lair would require the player to memorize the proper sequence and timing of their input, effectively making the entire game one continuous QTE. Such uses were also seen as giving the player only the illusion of control, as outside of responding to QTE, there were no other commands the player could enter; effectively, these games were considered the equivalent of watching a movie and responding every few minutes to allow it to continue. An improvement to the QTE mechanic was flashing the buttons that need to be pressed on the screen, which appeared in the laserdisc games Super Don Quix-ote (Universal, 1984), Ninja Hayate (Taito, 1984), Time Gal (Taito, 1985) and Road Blaster. Die Hard Arcade (Sega, 1996), Sword of the Berserk: Guts' Rage and most notably Shenmue (Sega, 1999) for the Dreamcast introduced QTEs in the modern form of cut scene interludes in an otherwise more interactive game. 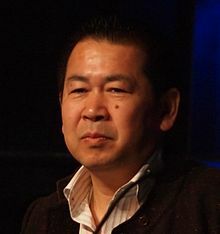 Shenmue's director Yu Suzuki is credited with coining the phrase "Quick Time Event", which were included in the game as to provide "a fusion of gameplay and movie" and create cinematic experience to the player. The game's manual called them "quick timer events", but the phrase became popularized as "quick time events" since its release. Since this period, several other games on modern console and game systems have included QTEs or similar mechanics. Quick-time events have also appeared in some sports games, such as the Wii version of 2010 FIFA World Cup South Africa, where they are used to save penalty shots and free kicks aimed towards the goal, or win possession of the ball after it is punted or corner-kicked. Failure to execute the quick-time event in time would result in the opposing team scoring a goal or claiming possession of the ball. To improve game accessibility, action games increasingly contain options to individually disable quick-time events and other design elements that contribute to a game's difficulty. QTEs have received mixed reactions from players and journalists. They can be used effectively to enhance cutscenes and other actions. The use of QTEs within Shenmue is often praised, as "they seamlessly flow from cinema to the QTE sequence without any loading pauses at all", and sections which utilized the QTE were considered "some of the most thrilling in the whole game". At the same time, they also are considered to be a weak addition to gameplay, and often force the player to repeat such sections until they complete the QTE perfectly to move on. They are often considered a "bane of action games", as their presence breaks the standard flow of the game and reduce the control of the game for the player to a few buttons, distracting, and turning interactivity into a job. Also, QTEs may frustrate the player due to the fact that they might not have any sign that they are about to happen. QTEs are often used during dramatic cutscenes. Resident Evil 4 uses QTEs (described by cinematics lead Yoshiaki Hirabayashi as an "action button system") to "facilitate a seamless transition between gameplay and the in-game movies" and prevent players from losing interest during cutscenes. One example in Resident Evil 4 is a knife fight. The fight occurs during a late-game cutscene where the protagonist meets a major villain, who explains missing links in the game's story while periodically slashing at the protagonist and requiring the player to quickly press a button to parry him. As the action takes place during the major revelation of the game, the QTE serves to prevent the player from skipping over the cutscene. While this example is considered to use QTEs effectively, punctuating the heating discussion between the characters with rapid player reactions, it also demonstrates a common failing with the mechanism, in that if the player should miss a QTE, the protagonist will be killed, and the player must restart the cutscene and the fight from the start. Because of the likelihood of player death, the phrase "Press X to not die" has become synonymous with the use of QTEs in game. Furthermore, when a QTE is used during such a scene, the player's attention is drawn away from the animation and instead to the area of the screen where the button control indicator would appear, rendering the effort put into animating the scene meaningless. Another problem with the use of QTE during cutscenes is that it can dilute the emotion and importance of the scene to a single button press, trivializing the nature of the scene. This issue was raised from Call of Duty: Advanced Warfare, in which during an early scene where the player character attends the funeral of a fallen fellow soldier, the player is given the option to press a button to mourn for the soldier. Forcing this type of interaction has been considered a poor form of storytelling, as some have argued the scene could have been played out without requiring player action to make the same form of emotional connection to the protagonist, or with the player give more control of the character. QTEs may be used to provide a limited control scheme for a scene within the game that would be otherwise difficult or impossible to perform with the game's standard controls. A second example from Shenmue II requires the player to navigate several narrow planks across a void in a disused building, every so often responding to a QTE to regain the character's balance, with each successive plank requiring more and quicker responses to QTEs. Failing to respond to the QTE leads to the character's death and requiring the player to restart the sequence. This sequence has been strongly criticized, as when the plank sequence is finished, the player is rejoined by another character who had used the elevator to bypass the floors, an option not given to the player. More recent games have used QTEs that occur more directly in gameplay and, when failed, do not end the game for the player. The God of War series uses QTEs as finishing moves: by completing the maneuver successfully, the player can defeat larger beasts or bosses, but failure to complete only leads to being tossed away, upon which the player can move back into battle to continue to fight. Often these are progressive QTE systems where the player is only partially penalized for missing the necessary commands; these often take place in boss battles. An example of this usage is from the game Ninja Blade; during a special attack by the boss, the player can attempt a series of QTEs to minimize the distance that the protagonist is pushed back down a long hallway from the boss, reducing the amount of time and damage that the character would then take in rushing the boss at the conclusion of the attack. Other positive means of incorporating the QTE is for manipulating the environment to gain a tactical edge; Gears of War 2, for example, includes one area where the player character and his non-player character squad are on a circular elevator, fending off hordes of monsters engaging them on all sides. By temporarily abandoning the battle, the player can engage the elevator through a QTE at its control panel to gain the high ground, though this gain can be nullified if the monsters engage a second control panel. A more recent use of QTEs have been within cutscenes themselves where failing to perform the QTE may alter or provide more details about the game's story and affect the character later in the game. In Mass Effect 2 and Mass Effect 3, certain cutscenes contain dramatic moments where a QTE will appear for a short moment, indicating an action that will drive the character towards either extreme of a morality scale. In one case, the player is given the opportunity to stop ruffians from firing upon a weaker character, with the QTE provided helping to boost the player towards higher moral standing. Telltale Games' The Walking Dead includes QTEs intermittently, creating tension throughout the game. Furthermore, during conversation trees with non-player characters, failure to select the next choice of topic in a limited time may affect later events in the game. More recently, the games Fahrenheit (Indigo Prophecy in North America) and Heavy Rain from Quantic Dream are primarily presented as sequences of QTEs, integrating the mechanic as part of the core gameplay, and present controller actions that correlate directly with the character actions on the screen; this was emphasized further in Heavy Rain by a game patch to support the use of the PlayStation Move motion controls where the player could actually physically perform the moves that corresponded with character actions. In both games, players may miss certain QTEs, or may be given a choice of multiple QTEs they could perform; opting of which QTEs to perform would alter the story, with the possibility of character death at some later point. In Heavy Rain, for example, the player controls the fates of the game's four playable characters, leading to numerous different endings if the characters remained alive and if they had discovered critical information. Even prior to Heavy Rain's release, the game's director David Cage had to defend his vision of the game from critics that were skeptical of the reliance on QTEs within Heavy Rain and created an early stigma on the game's reception. Despite the integration, Heavy Rain was often criticized for use of QTEs in otherwise non-dramatic situations. In an early sequence in the game, the player has to control the lead character to find his son Jason in the mall, with the only available action of pressing the "X" button to shout "Jason" with no apparent effect. With the onset of newer technology to improve graphics, controls, in-game physics, and artificial intelligences, gameplay elements previously simulated through QTEs can potentially be re-implemented as core game mechanics. Road Blaster used QTEs to steer the car and ram other vehicles off the road in pre-rendered animated scenes, while a modern game like Burnout Paradise gives the player full control of the vehicle and uses its game engine to create real-time crashes with other vehicles. Similarly, Dragon's Lair 3D: Return to the Lair recreates the experience of the pre-animated scenes from Dragon's Lair as a platform game, allowing the player to react freely to the environmental traps and monsters. ^ Mielke, James (2006-05-09). "Previews: Heavenly Sword". 1UP.com. Archived from the original on 2007-09-27. Retrieved 2007-12-19. Some points in key battles (usually with bosses) integrate QTE (quick-time events), which fans of Shenmue and Indigo Prophecy might like, but which we've been doing since Dragon's Lair and Space Ace. Time to move on, gents. ^ a b Main, Brendan (2010-06-08). "Year of the Dragon's Lair". Escapist. Retrieved 2011-03-06. ^ a b c d e f g h i j Waters, Tim (2011-02-08). "Full Reactive Eyes Entertainment: Incorporating Quick Time Events into Gameplay". Gamasutra. Retrieved 2011-02-08. ^ Graft, Kris (2014-03-19). "Yu Suzuki recounts the making of Shenmue". Gamasutra. Retrieved 2014-03-22. ^ Provo, Frank (2000-01-11). "Shenmue Review". GameSpot. Archived from the original on December 8, 2014. Retrieved 2014-12-05. ^ Hamilton, Kirk (2012-11-07). "What Do You Know, All This Time And We've Got 'QTE' Wrong". Kotaku. Retrieved 2014-12-05. ^ McAloon, Alissa. "In the name of accessibility, Spider-Man offers toggleable puzzles and QTEs". Gamasutra. Retrieved 2018-09-09. ^ "Shenmue". IGN. 2000-11-03. Retrieved 2011-03-06. ^ "Shenmue Review". Computer and Video Games. 2001-08-08. Retrieved 2011-03-06. ^ a b Hoggins, Tom (2009-05-22). "Heavy Rain preview". The Daily Telegraph. Retrieved 2011-02-09. ^ a b Reparaz, Mikel (2010-02-10). "The Top 7... Least-irritating quick time events". Games Radar. Retrieved 2011-02-09. ^ Hirabayshi, Yoshiaki (October 2005). "Postmortem: Resident Evil 4". Game Developer Magazine. Retrieved 2013-06-28. ^ Martin, Joe (2010-03-12). "Heavy Rain Review". Bit-tech. Retrieved 2011-02-09. ^ Kuchera, Ben (2008-09-19). "Quick time events: tap "A" if you're tired of them". Ars Technica. Retrieved 2011-02-09. ^ Durnbush, Jonathan (2014-11-04). "Press square to feel: The problems with 'Call of Duty's' funeral scene". Entertainment Weekly. Retrieved 2014-11-04. ^ Fahey, Mike (2014-11-04). "Nothing Says Funeral Like a Quick Time Event". Kotaku. Retrieved 2014-11-04. ^ Mastrapa, Gus (2010-01-26). "Review: Spin Your Own Space Opera in Mass Effect 2". Wired. Retrieved 2011-03-11. ^ Franich, Darren (2012-05-10). "'The Walking Dead' videogame review: A benign addiction". Entertainment Weekly. Retrieved 2012-09-10. ^ Pearce, Celia (2010). Davidson, Drew, ed. Well Played 2.0: Video Games, Value and Meaning. ETC Press. pp. 170–173. ISBN 978-0-557-84451-7. ^ a b Vinson, Dana (2010-09-01). "The Verdict: Heavy Rain PlayStation Move Edition". G4 TV. Retrieved 2011-02-09. ^ Bramwell, Tom (2009-08-09). "David Cage rants about quick-time events". Eurogamer. Retrieved 2011-02-09. ^ McElroy, Justin (2010-03-17). "'Press X to Jason' distills Heavy Rain". Joystiq. Archived from the original on June 29, 2011. Retrieved 2011-02-09. ^ Goldstein, Hilary (2002-11-12). "Dragon's Lair 3D". IGN. Retrieved 2011-02-09.